On November 2, I attended the Awards Program for The Once Upon A World Book Award. The event took place at The Museum of Tolerance in Los Angeles. This award was established by Sonia Levitin and her family to "support and perpetuate the values and mandate of the Simon Wiesenthal Center & Museum of Tolerance by honoring children's books ... which deal with issues of tolerance, diversity, human understanding and social justice, thus inspiring a young reader to promote positive change in the world." In previous years, only one book for younger readers was chosen. This year, the Young Adult category was added. The books that were honored this year are SURFER OF THE CENTURY by Ellie Crowe for younger readers, and JEANETTE RANKIN: POLITICAL PIONEER by Gretchen Woelfle, for YA. Gretchen is a local writer, and I was delighted when she invited me to this wonderful event and took the time to share her thoughts about the award and some other exciting activities related to her book. What inspired you to write about Jeanette Rankin, the first woman elected to congress? Back in the 1990s I worked as a scriptwriter for interactive multimedia educational programs. 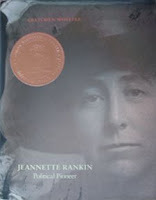 One of our projects was called 100 American Heroes and during my research I discovered Jennette Rankin. I’d never heard of her, and was intrigued by this woman who was ahead of her time in many ways. Years later, after I became a book author, I discovered there were no full-length children’s biographies of her – and off I went. Any biographer will tell you that research can be endless, and for me that’s a plus. When you choose someone who lived nearly as century – 1880-1973 – and was involved in most of the political movements of that century, you can research endlessly. [Deep dark secret: Often I find research a lot more fun and a lot easier than writing.] I did all the usual things: read books and researched online for primary documents. It’s hard to imagine how books got written before the internet! My picture research led me to the Library of Congress Prints and Photographs collection (online!) and to state historical societies and university libraries. The Papers of Jeannette Rankin are stored at the Schlesinger Library at Harvard and they sent sixteen rolls of microfilm to my local library. Rankin had a clipping service while she was in Congress and I found all sorts of tasty tidbits to include in the illustrations. What was the most fascinating thing you learned during the research process? Rankin didn’t like to write, but she loved to talk. Fortunately the Suffragfist Oral History Project at Berkeley recorded several interviews with her in 1972. Transcripts of those interviews are now online and I was able to download and read 275 pages of Jeannette’s own words and speech patterns. Thus I was able to include many direct quotes from Rankin in my book. Tell me a little bit about the video conference you had on election day. As you know, Jeannette Rankin: Political Pioneer, won the first Young Adult Once Upon A World Award from the Simon Wiesenthal Center/Museum of Tolerance. Two days after a lovely award ceremony, I took part in a video conference at the museum with three groups of students – a middle school from south central LA, a private Jewish girls’ school, and a group of middle schoolers in Missoula, Montana (Rankin’s hometown.) A week before this event I had traveled to Missoula to take part in the Montana Festival of the Book, and had given a talk to the students who took part in the video conference. For an hour the three groups and I talked about Jeannette Rankin and how I wrote the book. Toward the end, one student from each group stood up on a “soapbox” and told us about his or her hero. A girl in Montana chose Rankin for her courage and perseverance. A boy from LA described his mother, who never gave up working for what she wanted – just like Jeannette. I seem to have caught the biography bug and am working on several of them – from picture books to YA – from American history. I find that as I do background research for one subject, I come across a second and then a third. Writing biographies combines the best of fiction and nonfiction. You’ve got all the elements of fiction to work with -- protagonist, conflicts, setting, narrative arc – and you get to do all that research! Gretchen, thanks for taking the time to chat abour your work and for showing readers and writers that non-fiction really is exciting! My friend Heidi Estrin shared the exciting news about the new AJL podcast. There are some really terrific programs available. Please check it out! Author talks, lectures on Jewish literature, panel discussions, and workshops are among the offerings of the newly launched Association of Jewish Libraries Podcast. Available at www.jewishlibraries.org/podcast, the program provides audio that enhances and enriches the listener's appreciation of Jewish book culture. The podcast will include material recorded at the Association of Jewish Libraries annual convention, as well as recordings of Jewish literary events across North America. A wide range of topics will be covered, from the academic to the hands-on, from children's literature to technology. "Jews are book lovers, and Jewish librarians even more so," says Susan Dubin, President of the Association of Jewish Libraries. "The AJL Podcast gives us a way to share our enthusiasm with others, without geographical or scheduling restrictions. Now everyone can learn and enjoy!" New podcast episodes will be posted every few weeks. Listeners can hear the show online at www.jewishlibraries.org/podcast, subscribe via iTunes or other feed readers (using the feed http://feeds.feedburner.com/ajlpodcast), receive episodes by email via FeedBlitz, or listen by phone at (651) 925-2538. To celebrate the launch of the podcast, AJL is offering a Jewish book give-away. Forward this press release or post its contents on a blog or web page to be entered into a drawing for five Jewish interest books from Hachette Book Group. Be sure to CC jewishlibraries@gmail.com on any forwarded messages or to email us about any posts. Complete contest rules and information about the give-away titles can be seen at jewishlibraries.org/podcast - click on the Contest page in the sidebar. Deadline for entry is December 12, 2008.